Can Modi wave help BJP reclaim Karnataka? Is Congress's pitch for second capital an election ploy? When she was about 40, Saalumarada Thimmakka—heartbroken after being repeatedly called barren—jumped into the village pond to end her life. But, as fate would have it, she held on to a plant and survived. Almost 65 years later, the green crusader beams with pride every time people address her as Vruksha Maathe (mother of trees). 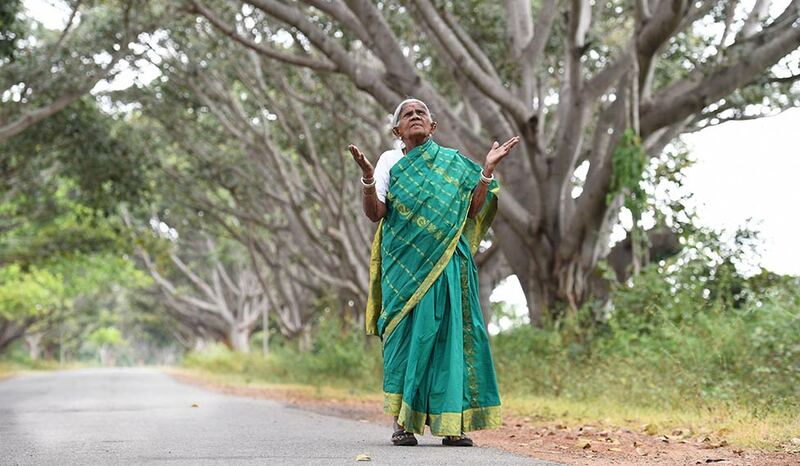 “Saalumara”, which means a row of trees in Kannada, was prefixed to her name after she planted about 400 banyan trees in Hulikal village, and thousands more elsewhere in Karnataka. In 1948, Thimmakka, with her husband, Bikkaluchikkaiah, started planting saplings to overcome the pain of being childless. Today, as you drive about 35km from Bengaluru city (towards Kunigal) and enter the Kudur panchayat, a soothing breeze whistles through the thick canopy of their trees. It was in 1948, after 20 years of marriage and several attempts at adoption, that Thimmakka and her husband embraced trees. They moved away from quarrelling in-laws and focused on their mission. In 1958, two village headmen, who were on their way to the Sugganahalli cattle fair, spotted the couple watering the trees. They felicitated the couple with a silver medal at the fair, which is a prized possession to date. In 1991, after 63 years of companionship, Bikkaluchikkaiah died. 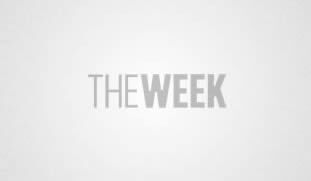 Ironically, he was jailed for cutting a dry branch of a tree he had planted, which led to a deterioration in his health, and ultimately death. Thimmakka was left with a dilapidated hut. Unable to bear the harassment of her husband’s relatives—who tried to usurp her land—she sold her four acres for Rs 70,000. That year, rains washed away her home, too. However, with help from a well-wisher, she rebuilt the mud house and applied for a widow pension of Rs 75 (now Rs 500). In 1994, her life took an interesting turn. Veteran Congress leader Shamanuru Shivashankarappa was travelling through Hulikal in his car; the afternoon sun had exhausted him. Suddenly, he felt a cool breeze and stopped to see the trees. He then went looking for the “old lady” who had planted them. “He appreciated us and gave me Rs 5,000,” recalls Thimmakka. “For a moment I thought I was dreaming. He mentioned our efforts in his public speech at Ramanagara. 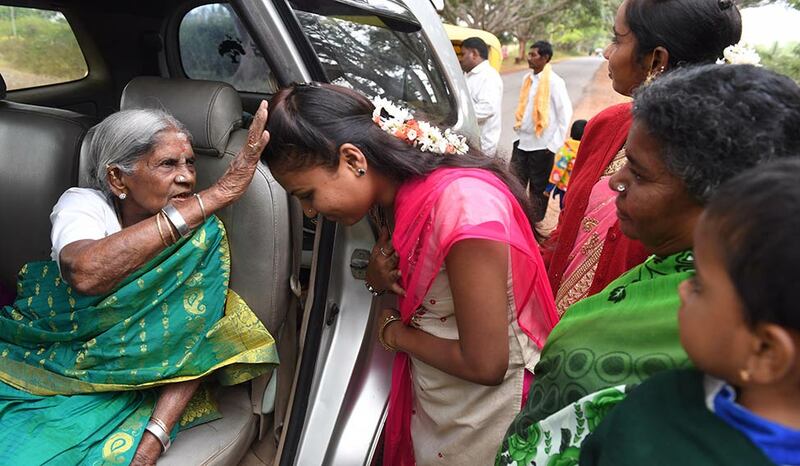 Soon, the media and the people started coming to my village to meet me.” Since that day, though she was illiterate, Thimmakka started collecting heaps of fan mail and media reports. An article published in an English daily drew the attention of Sachidanandaswamy, a Rajya Sabha member, who in turn referred Thimmakka’s name to Justice P.N. Bhagwati, who was heading the selection committee for the National Citizen’s Award. On December 23, 1996, Prime Minister H.D. Deve Gowda gave Thimmakka the award. When Belur approached her for the biography (Saalumarada Saradaarini, published in 2015), Thimmakka agreed, on condition that the book should not read like a film script but remain truthful to her life. 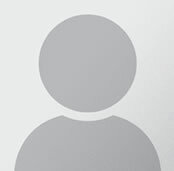 After the national award, there was a steady stream of awards and accolades. Recently, BBC picked her for the Top 100 most influential and inspiring women in 2016. Another high point in her life was when Karnataka Chief Minister Siddaramaiah announced funds for the ‘Saalumarada Thimmakka Shade Plan’ in 2014-15 and again in 2015-16, as part of the mission to plant trees along roadsides.